When the first Les Paul models were being prepared for launch into the solid-body guitar market in 1952, Gibson was looking for some way to make a big impression. 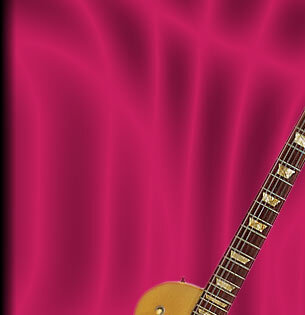 Les Paul himself suggested that they issue the instrument in a luxurious gold-colored finish, a decorative scheme that was retained for the next six years. Called "gold tops" in the vintage guitar trade, some instruments were in fact colored gold on the sides and back as well. The solid-color paint masks the underlying structure, composed of a mahogany body with a carved three-piece cap of maple, theoretically resulting in a guitar that combines the tone of these two woods. Compared with Fender's Telecaster and Stratocaster models, the perfectly rounded outline of the Les Paul (reminiscent of certain Gibson arch tops) is anything but radical. It is also a heavy guitar, but in compensation for the load it puts on the guitarist's back it has a tone that players find extremely versatile. 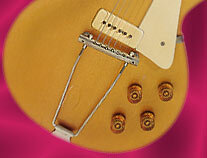 The earliest Les Pauls featured a wire-like string holder called a "trapeze" tailpiece, combined with the bridge. Players were not enthusiastic about this design, since it interfered when trying to dampen the strings with the palm of the hand.